Many years ago I bought a book called the "Wild Wings to the Northlands" by Stan Bayliss Smith in which he recounts an epic adventure in the 1960's that went from England, south to the Mediterranean in April, and then north with the spring eventually reaching Varanger Fjord in arctic Norway by early June. This book has always been an inspiration for me, and I have been on various short trips to Norway, Sweden and Finland in recent years. However until this trip I had never tried to follow in his footsteps. 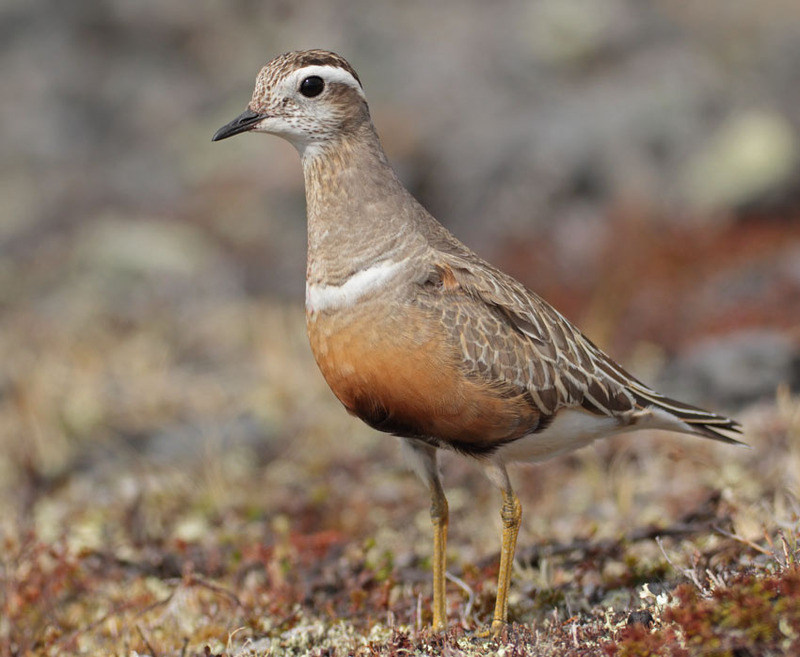 So it was that on this splendid June day in Lapland, well above the arctic circle, we found ourselves climbing this mountain in the vague hope of finding the Dotterel that the Bayliss Smiths had found here almost 50 years earlier! Initially we wandered across the summit plateau and found nothing much of interest so we sat down and had our picnic lunch enjoying the dramatic Lapland panorama, with snow covered mountains visible to the north west. Immediately after lunch we were amazed to bump into a very confiding Dotterel pottering around the tundra, almost completely unconcerned by our presence. So having carried the 7DmkII and the 400mmf5.6 all the way up on the off chance of just this encounter, I leapt into action! Many shots later we beat a cautious retreat as it appeared to have settled down to brood. This is probably my favourite shot of this delightful bird, from low down on the up sun side of the bird, which gave nice lighting and the all important catch light in the eye. I have seen a few of these birds in the UK over the years, but I've not been able to get close enough to any of them with a camera.